Berkeley City Council votes to explore housing homeless in prefab mini-apartments. The Berkeley City Council voted to explore housing low-income and homeless people in prefab "micro-unit" assisted-living buildings run by non-profits and built by private developers. Panoramic Interests displayed one of these units, which the developer has branded "MicroPADs," near Civic Park last month, inspiring curiosity in passing Berkeley residents. The "Step Up Housing" initiative that passed Tuesday was sponsored by City Councilmember Ben Bartlett. It would require the city to find city land that could be used for modular buildings with below market rental units, expedite permitting and approvals for projects, select a developer to construct the building at no cost to the city, contract with a non-profit to manage the building, and establish criteria for selecting senior citizens, disabled people and currently homeless Berkeley natives. 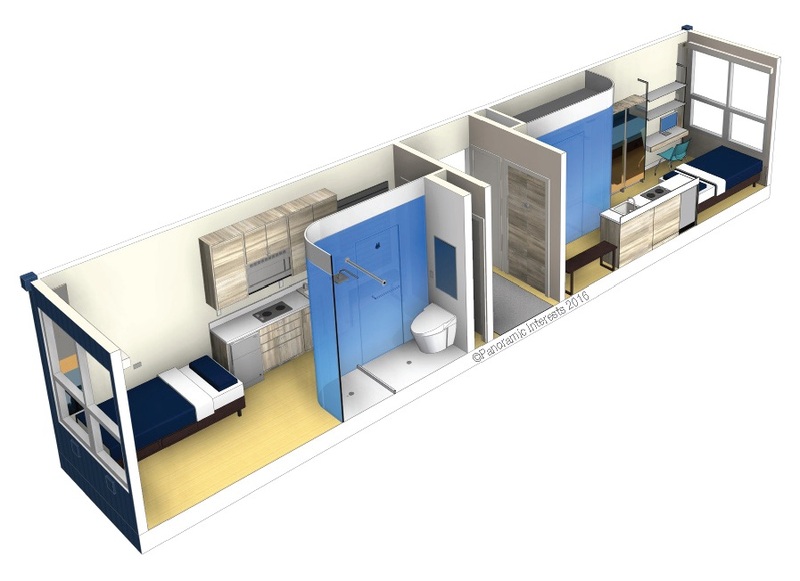 Panoramic designed the MicroPAD specifically for quickly constructing for housing the homeless. Each 160-square-foot studio comes furnished with an oven, bathroom, and sink. The model is single room occupancy hotels but with better construction and supportive services for people who might be transitioning off the street, said Zac Shore, of Panoramic. "Throughout the history of our country, residential hotels have been a really effective way to provide affordable housing. Recently, we've stopped building them because construction costs are so high for small, compact units," Shore said. Panoramic's idea is to reinvent the residential hotel for a new generation with bigger units and more privacy, including an in-unit shower and toilet. Assembly line construction techniques means costs are lower. The steel units are assembled in China, shipped to the US, and stacked to make a building. Berkeley's initiative calls for a 4-story, 100-unit building. Panoramic's owner, Patrick Kennedy, said he wants to build 5,000 units across the East Bay and rent each micro-apartment for $1,000 per month. If Berkeley identified a lot or space above an existing city parking garage, Kennedy's firm could construct the first MicroPAD building for $20-25 million dollars. The exterior would be designed to fit in with the neighborhood. The city would hire a housing non-profit to manage the building and provide supportive services to tenants. Bartlett said he was inspired by Kennedy's model but the bidding process would be competitive. The furnishings are sleek, with curved glass separating a bathroom from the rest of the unit, two tiny closets, a small refrigerator with a separate freezer, a desk with space for a TV, a big window with shades, and a bed. But the MicroPADs were designed with some of the challenges of housing the homeless in mind. There's a blacklight underneath the bed to discourage bedbugs and drains in the floor in case a unit needs to be hosed down during a deep cleaning. Panoramic has two other developments under construction in Berkeley and two high-rises in San Francisco that house students. Modular construction is more common in Europe, Shore said, and it's high time that the US caught up. Joycelyn Golden, who runs a soup kitchen in Oakland, was impressed with the sample unit she saw on the street. "We've been trying to figure out anything to bring people out of the cold," she said. "We've been thinking of a tent city like Curry Village in Yosemite. But this would provide more safety and protection. There's people out there who have a small income and can pay a little rent. They just need somewhere to go." Others expressed enthusiasm for the model and hoped that Berkeley's leaders would take any sort of action to house low-income and homeless residents. One man peered inside, admired the kitchen cabinets, and asked how much the rent would be. He said he was homeless but wouldn't provide his name. When a Panoramic employee told him it would be free if he qualified, he shook his head and snorted. "The city's never going to pay for that. I doubt they'd ever get it done," he said.